One very common issue that divorce and child support attorneys deal with for their clients is where the florida department of revenue undertakes enforcement of the other parent’s child support order. This occurs when one parent is receiving state benefits, such as food stamps or Medicaid, and the state of Florida DOR takes over enforcement of child support in an effort to reduce the need of the receiving parent’s need for those expensive state benefits. Another reason for the state involvement is to recoup some of the funds that the state has paid out in benefits through the collection and disbursement process. A common complaint among child support paying parents in post divorce DOR child support cases is that they do not receive adequate notice of motions and hearings and therefore they miss out on the ability to attend hearings and are found in contempt or receive unfavorable results compared to what they would have gotten had they known about and attended the hearings. There are many reasons that parents give for not receiving notice of hearings and copies of motions. The first, and most common, is where a parent changes their address and either does not update the address with the court or attempts to update their address, but does not do so properly and still has court documents going to an old invalid address. Almost every time we meet a person who has missed an contempt or other important hearing when we check the clerk of court’s docket we notice that mail was returned as undeliverable to one of the parents. The other common complaint that parents give for missing out on notice of hearings is that correspondence from the Department of Revenue, when it comes in the mail, is easily mistakable as junk mail. For example, the photo to the left shows an envelope that a recent client received from the Department of Revenue containing an important document in his child support case. This client nearly threw away this price of mail without even opening it thinking it was a collection letter or a sales solicitation as it had no return address or identifying information. It is important to note that the Florida Department of Revenue has not done anything wrong in either of the above examples. The notice and service requirements for their motions and hearings only require mail be sent to the last known address and cannot hold up the court process if a parent did not properly update their address information. 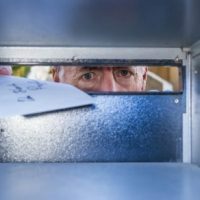 Likewise, the DOR is not required to send their correspondence in specially marked envelopes and child support hearing officers will not accept a defense of “I thought it was junk mail”. For these reasons it is extremely important for parents who who have child support cases to go above and beyond to make sure their address is updated with the clerk of court and with the Department of Revenue. This can be done by requesting a geographical update form and submitting it directly to DOR in addition to notifying the clerk of court. Additionally, one can never ignore any price of mail no matter how much a letter may look like junk every piece of mail should be opened and carefully be examined.